Croatia is becoming increasingly trendy and known as the “place to be”. Perhaps it’s the turquoise waters, its incredible natural landscape, its wonderful climate and its many beautiful, and undiscovered spots – both urban and rural. It’s a wonder that this Balkan country wasn’t discovered until recently. So, read carefully, soak up all that we’ve got to say about Croatia discover why it is one of the best honeymoon destinations. There are hundreds of reasons to fall in love with Croatia. It is part of the Balkan Peninsula, and is bathed in the Adriatic Sea which forms part of the Mediterranean Sea. It is here that you’ll find over 1185 absolutely stunning islands all spread along 1700 kilometers of dazzling blue Dalmatian Coast. One of Croatia’s best attributes is its climate; the combination of the sea breeze and long hours of sunshine, Croatia and its many islands enjoy perfect temperatures. In addition to this, every part of the country oozes a sense of peace, tranquility and, of course, that sweet essence of the Med. Croatia also has a rich and fascinating history which links seamlessly with the recent Avant-garde movements in the more cosmopolitan parts of the country. Croatia gained independence from Second Yugoslavia in 1992 and since battling for democracy the country obtained its first, totally democratic elections in 1999. Following a major overhaul, the country managed to achieve one of its greatest ambitions and in 2013 became a member of the European Union with Zagreb as its capital city. Croatia’s 1185 islands and 1700 kilometers of coastline are perfect for exploring by boat, which might be your best bet for enjoying your honeymoon to the max – imagine cruising through those Adriatic waters and enjoying the innumerous shades of blue. Everything about the Sea is pure, relaxing and even restorative. 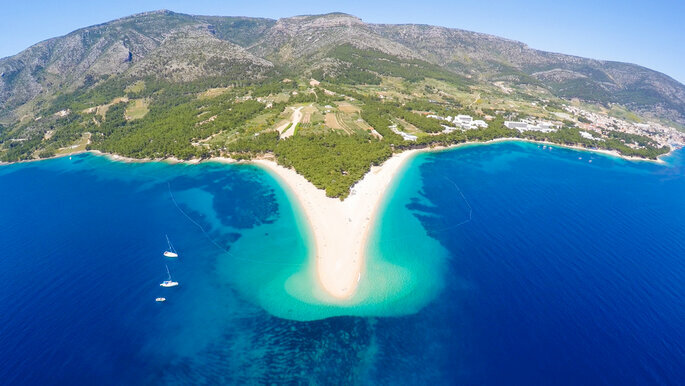 We definitely recommend giving diving and snorkeling a go, and make sure you visit Raduca Beach, which is close to the city of Primosten and is considered one of the country’s most beautiful beaches. 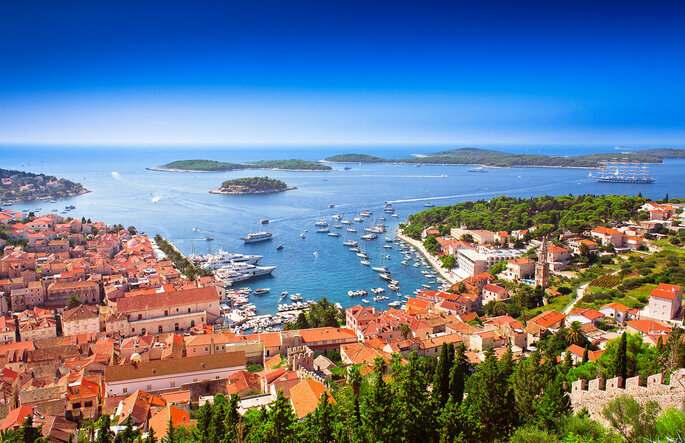 The islands are one of Croatia’s biggest attractions, with Hvar becoming an increasingly popular Mediterranean holiday destination thanks to its mix of beaches, lavender and mind-blowing hotels such as Adriana Hvar Spa Hotels and Amfora Hvar Grand Beach Resort. In Brac, the Zlatirat Beach, situated next to a woods full of pine trees and even an ancient Romanian villa, is the main attraction with its ever-changing shape due to the ebb and flow of the beach’s waters, and not far away the Bol Hotel is also a popular destination. Likewise, Korkula, Marco Polo’s birthplace and where his fort was is a popular place to visit. 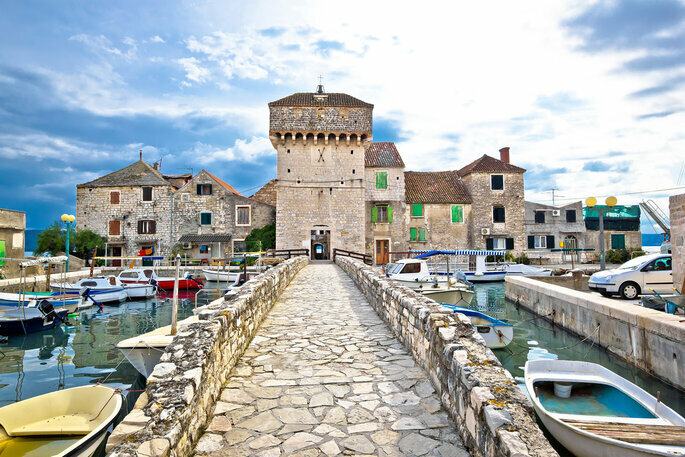 Cres, known for its famous lamb-based dish, and Rab, famous for the range of coastal activities it offers and its old medieval town are some more of the Islands’ treasures well worth visiting. On Ciovo Island the Hotel St. Cross, Villa Saint Cross and Hotel Bol are just a few more of Croatia’s brilliant hotels that will be waiting to welcome you with open arms. The Istrian Peninsula which Croatia shares with Slovenia and Italy offers some of the most beautiful coastline and is known for its handful of luxury hotels such as Lone, an exclusively designer hotel with several pools and a spa. There is also Monte Mulini, which has its own stunning gardens as well as an impressive pool and cutting-edge restaurant. Like many other resorts in this area and some others in Vrsar, both these hotels belong to the prestigious hotel chain Maistra Hotels & Resorts. Also in the Istrian Peninsula, is Umag, another noteworthy hotel belonging to the Istatourist chain, known for the incredible stays. Likewise, Hotel Meliá Coral stands out from the crowd for its several swimming pool areas and its own Asian wellbeing centre, whilst the Hotel Sol Aurora, another luxury hotel is the first Croatian hotel with a commitment to the environment. Mediterranean landscape is some of the finest in Europe and some of the most biodiverse too! In fact, Croatia is one of the most biodiverse European countries with four distinct eco-regions (Mediterranean, Alpine, Pannonia and Continental) which are home to a vast range of flora and fauna. The warm and dense Mediterranean forests are ecosystems par excellence, providing a habitat for the majority of plants and animals native to Croatia. It is estimated that somewhere between 50,000 and 100,000 species are present in Croatia, with at least 1000 of these species considered endemic to Croatia. The Croatian landscape is also replete with wetlands, meadows, swamps, marshes, scrubland and of course coastal areas and marinas all bursting with wildlife. What better wedding present is there than being able to experience Croatia’s wildlife up close and personal? 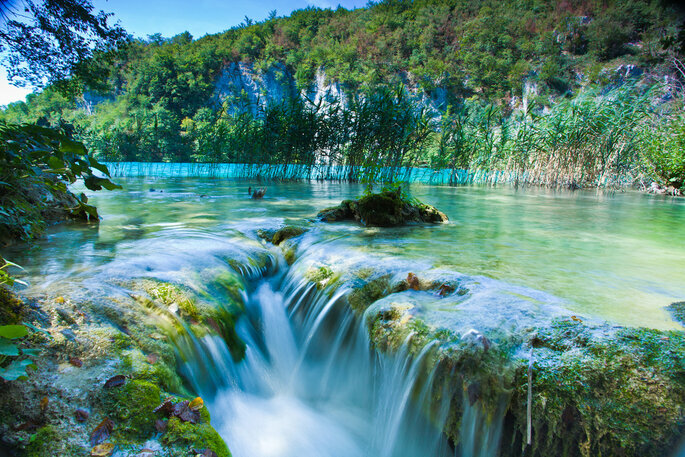 Plitvice Lakes National Park is one of the country’s major attractions. This parkland paradise has 16 beautiful turquoise lakes with waterfalls and sumptuous woodland and plant life all around. The perfect place for a stroll arm in arm with your other half whilst taking some spectacular honey moon photos. Why not make a visit to Krka National Park which works hard to protect Croatia’s ecosystems. Within the park you will find Skradinski buk, a natural pool surrounded by some impressive waterfalls. Zagreb is often thought of ‘Little Vienna’. It is Croatia’s capital city and a relatively unknown yet much adored bastion. There is a mix of cultural activities on offer here all of which are perfect if you’re looking for that typically European honeymoon. Some of the last vestiges of the Austro Hungarian empire are still visible in the midst of the city itself, for example some of the streets, parks and landmark buildings. 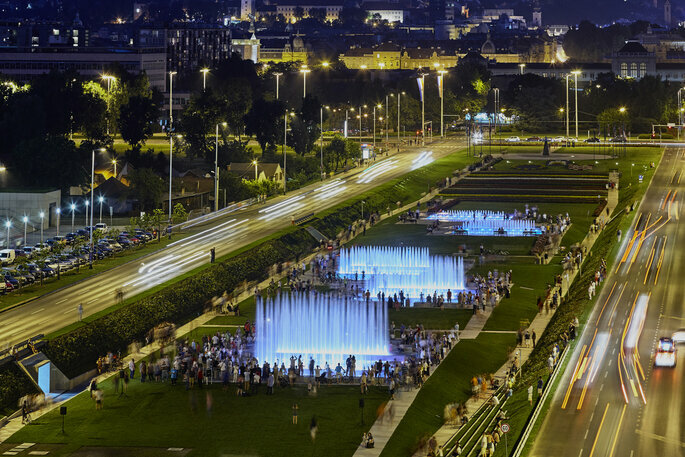 The Zagreb locals enjoy their café terraces, town squares and parks all year round. Whilst in Zagreb why not discover the Old Town, travel back in time in the Upper Town. Make sure you visit Trg Josipa Jelacica Square, and take a trip to the Mirogoj cemetery and enjoy its beautiful gardens and breath-taking cathedral. Another one of Croatia’s gems is undoubtedly Dubrovnik, a magical city with a real medieval feel to it. Many of the original stones used to build the city still stand today such as the city walls from the tenth century, although the wall and other parts of Dubrovnik’s medieval treasures have had to be restored in parts. In fact is a city that has witnessed several natural disasters and has also had to recover from damage caused by wars that took place over the course of the centuries. However the city certainly retains its charm thanks to the careful work of the restorers. Nowadays it is a charming and beautifully designed city with a distinct Middle Ages appearance. In fact the city was even used as part of the set for scense in Game of Thrones. Whilst you’re in Dubrovnik be sure to admire the city wall in all its glory and get an incredible panoramic view of the city from one of the sixteen towers set into the wall as well as Stradun Street and Luza Square which is home to the Sponza Palace, the Belltower and the Church of Saint Blas. Gradska Kavana is well worth the visit too! Also make sure you take the time to visit some of Dubrovnik’s pebble beaches both near the city and also on Lokrum Island that you can get to by ferry. Two different settings for a perfectly complete honeymoon! Split is the third of Croatia’s most famous cities although there are others that are equally stunning and worthy of a visit. 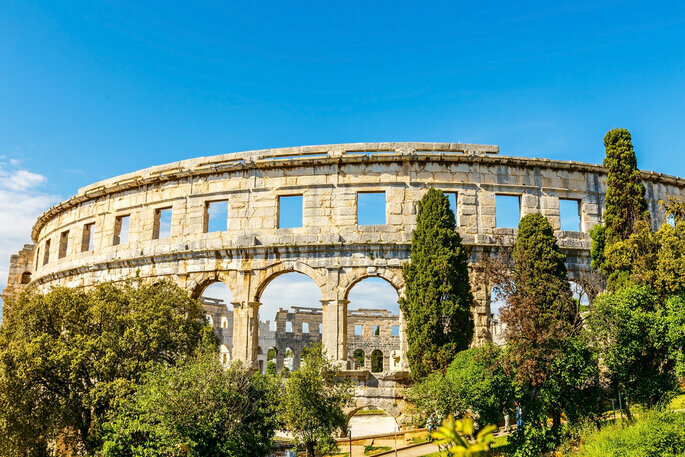 Split also has a strong medieval feel to it and is also where Croatia’s palaces can be found along with incredible Roman remains and a beautiful seaside town. It’s on account of all of this that Split has been declared as a World Heritage Site. The centre of the city is located in Diocletian’s Palace, a magnificent building complete with turrets and its three famous gates (Porta Aurea, Porta Argentea and Porta Ferrea). 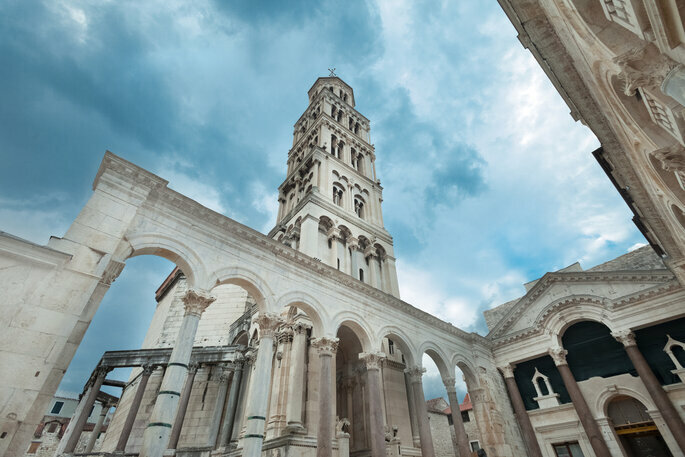 Split’s Cathedral definitely deserves a visit too! However, the city itself is a wonderful maze that is a pleasure to to get lost in and explore. We would also recommend taking a stroll along the seafront as a great way to finish your city adventures. Still very much present in Croatia’s atmosphere is the country’s turbulent history. Political unions, periods of discord, significant monarchic periods such as the Habsburg and Austro Hungarian rule. The country also endured a period of communist rule as well as wars of independence which established the destiny of some of the country’s larger cities. As a result of all its history, some parts of it have become stigmas of a time gone by, some of which are well worth a visit – why not visit the magnificent Walls of Ston and appreciate their grandeur as some of the largest walls in Europe, or if that doesn’t tickle your fancy, make a trip to Trakoscan Castle, which overlooks a stunning lake. Two cities of great historical importance are Varazdin, which is heaving with monasteries and churches which continue to bring the city’s history to life, and Primosten, situated on a small island with incredible beaches. Croatia is a little slice of paradise right in the centre of Europe. Nowadays with a greater focus on its tourism industry, it’s the perfect place to visit and discover all its charms. Pack your bags and enjoy a different, and undoubtedly special honeymoon whilst still enjoying that typical Mediterranean feel. Looking to honeymoon further afield? Check out our top Thailand hotels or the best of the Caribbean’s luxury accommodation.